When you’re looking for a painting company in Indianapolis to paint your house or business, you want to know you made the best possible choice. You want a knowledgeable team to take care of your needs and provide the top-notch residential or commercial painting services you expect. You want to know that with all the other options out there, you’ve chosen a painting company you can trust to get the job done as quickly and professionally as possible. You want the professional painters at Sharper Impressions Painting Company. With over two decades of experience in all kinds of paint jobs, whether it’s interior or exterior painting, our house and commercial painters know their stuff well enough to answer any questions you may have. We’ve enjoyed getting to work on countless homes and businesses throughout Indianapolis and surrounding suburbs, and we can’t wait to paint yours next. The process is simple: you request an online quote, and we’ll put together a team of experts to get your paint job done. We take pride in scheduling your customized painting services in a timely manner, so you can have peace of mind knowing your scheduled appointment will be strictly followed by our professional painters. Perhaps the City of Indianapolis’ best quality is its ability to feel like a cozy and friendly home, despite being the 12th largest city in the US. That close-knit community feeling is why we love Indy and its surrounding suburbs just as much as you do. With a plethora of sporting events, cultural attractions and a growing business industry, there’s always something to do in Indy. Since there’s so much to do and see around Indy, spending your free time painting your house is the last thing on your mind. Luckily, Sharper Impressions Painting provides top-notch house painting services to homeowners across Indianapolis and in suburbs like Zionsville and Westfield. As a renowned painting company serving areas including Fishers and Carmel, we offer customized services to suit our clients’ busy lifestyles. Looking for a professional painting company in Indianapolis to give your home a fresh look? Call Sharper Impressions Painting today to schedule a free estimate, or request a free quote by filling out the form below! What makes Sharper Impressions your best option for professional painters in Indianapolis, IN? Two and a half decades of service has given us knowledge and experience in the industry, which has earned us several awards and countless customer referrals. 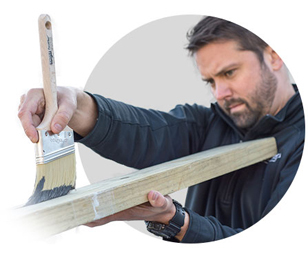 We have always been, and will continue to be, determined to do the job right from the start: giving you the friendly and professional service you expect in a painting company.